Utila is one of the world’s most renowned scuba diving locations and one of the reasons Geof met me in Honduras. He wanted to check out the renown Utila dive center. After picking him up in the airport and spending a night in dodgy La Ceiba we caught an early morning ferry to the island to find a dive shop in Utila. As soon as we exited the ferry there was a mob of people flashing brochures of dive shops and hotels, promising cheap prices and free accommodations. It was completely overwhelming but Geof hadn’t planned to dive for a few days so we decided to put our bags down and start the trip off right with brunch and a few cuba libres at the corner bar, Las Pirates. There we met John, an expat Canadian who ran the bar. He offered his services if we were in trouble as he was a member of the Canadian Embassy. At that time our only problem was choosing the right dive shop as all the prices are practically the same. John suggested we put together a list of questions as that would begin to separate the shops and while we had no idea what to ask, fortunately John did. Our situation was a bit unique because Geof was diving and I was not, but these questions are a good starting point to help decide which is the best shop. Does it include all of the equipment? Are there any free fun dives? Does it include the mandatory reef fee? If I pay with a credit card what is the additional fee? How many instructors on each dive? Where do you dive? How many times do you go to the North, where the best diving is (according to Lonely Planet)? Can we see the equipment? How large are the air tanks? Are equipment rentals free for snorkelers (non-divers) staying at the hotel? Is it covered for mid-day sun? Is lunch served on the boat? Will there be food? Water? Can I come on the boat to snorkel when Geof dives? For free? How many nights free are included in the course? Can we see the room? Are there any additional costs for me to stay? Are there any kayaks? Are they free? When is the last time you saw whale sharks? While it appears that the shops offer similar services with comparable prices the answers to these questions helped us see the differences. In the end we chose a shop that we knew had a great reputation and good price. But what won us over was their easy going attitude and they didn’t charge extra fees for me on the boat or using their gear as it didn’t cost them anything. If you have been to an Utila dive centre let me know in the comments where you’ve been and how you liked it! If you liked this post check out when I eventually learned to scuba dive in Mexico. Great list of questions. I learned to dive in Utila and had an amazing experience. The one thing I see missing is the atmosphere of the dive center, especially if you will be staying there. Some dive centers are wild, party places and some very laid-back and most in-between. It doesn’t make the outfit better or worse, but it is probably best to choose one that matches your personality and interests. As for going to the North, be wary if they tell you they go there all the time, as quite often the choice is made by the captain, based on conditions, rather than by the divemaster or instructor. And, speaking of boat captains, a good one can definitely enhance the experience. For those who care, I chose Cross Creek, which is owned by the same person who owns Utila Dive Center. Great list of questions, me and Kirsty are looking into where we want to spend a few motnhs diving and with Kirsty not sure how far she wants to take some of these questions are very relevant. Thanks for this post! I’m very interested in getting certified to SCUBA when I am on my RTW. Was Geof getting his certification in Utila, already certified, or doing some non-certified dives? 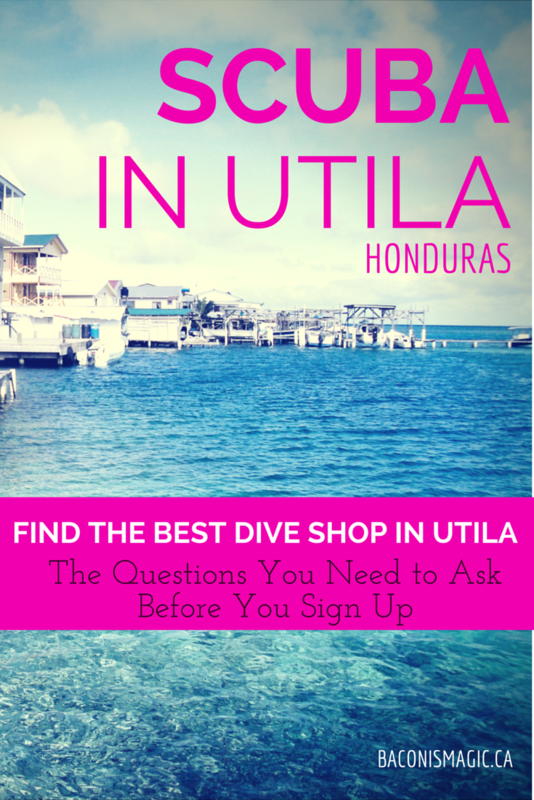 What was the shop that you used and what is the going rate these days for diving in Utila? Geof was taking his advanced certification but I saw the prices for the beginners. They generally ran 240-280 for the course, 4 nights in a hostel and 2 free fun dives. We decided to go with Captain Morgan because they are located on these small Cays on the North Island and they say the North is the best place to dive. The other shops do go to the North once or twice, so be sure to ask how much The only drawback with Captain Morgan’s is that the cays are super small so theres no nightlife like Utila but that was okay for us oh and no wifi. CM wasn’t going to nickel and dime us like some of the other shops for me staying in the room and using the equipment etc. Honduras is cheap but doesn’t hold the cheapest crown as I’ve seen prices advertised for lower in Colombia. I highly recommend talking to John at Las Pirates and be honest with the dive shops and say you are shopping around, surprisingly they are very cool about it. I found this diving story very interesting since Geof loves the diving. Did you like the snorkeling?Did you take some pictures of this experience?So sorry you were so sick on the boat. It would make me not go on another one!!! I’m glad to be reading this post. After Guatemala we’re looking at going to Utila for the SCUBA certification. I’m totally going to be using your questions. Thanks a million! The one thing I wish I’d done in Costa Rica was learn how to dive. I was in the process of picking a dive shop I felt comfortable with when my life got turned upside down. I can’t wait to read more! When I was in Koh Tao, my friend went diving and I did not. I wish I had asked to go on the boat now that you mention it! We went to Utila a few years ago to do our Dive Masters. Deep Blue Divers was who we dove with. I wonder if they are still in operation. When we were there they were in the process of building a resort on the other side of the island. Something tells me they would be completely out of our price range today. Diving in Utila is fabulous, you’re going to love it. This is where I want to go to get my PADI, great post! All of the dive shops were 10-20 dollars within each other and I’m sure any of them would have matched the lowest price for business. It’s a small island so everyone knows what everyone else is doing. I know nothing about diving but these seem like great questions to ponder before choosing! I knew nothing either, how quickly we become experts! I am heading to Utila in a few weeks on my own. I was thinking about going through Captain Morgan’s for the dive certification. 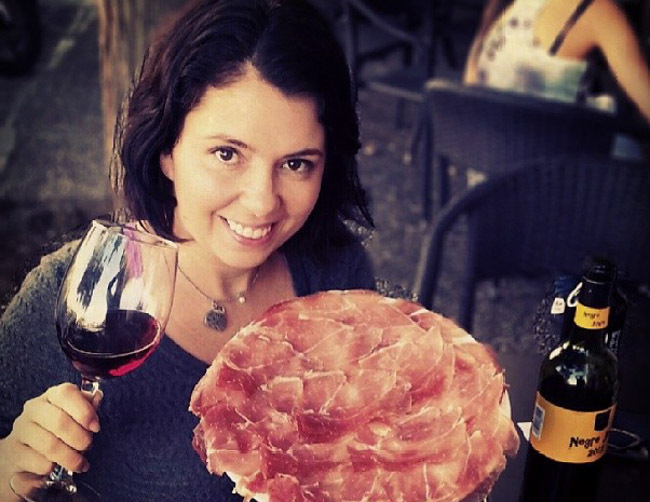 I am 28 years old so not really big into partying but would enjoy some night life and social interaction. I know you can choose to stay on the Cays or on Utila. Any advice on whether I should stick with Captain Morgans and the Cays or try somewhere else? Well if you are going for a few weeks you can spend time on the cays to dive, the night life is pretty much non-existant but you do interact in the same house with the other divers. You have to get up so early anyway and can’t dive hungover that when we were there Geof didn’t drink at all, it was only 4 days. Then when he was done we went to Utila which has a lot more nightlife. When you get off the boat you will be bombarded by people trying to sell you hotels and dive packages, take their cards but commit to nothing. I’d actually just stay one or two nights on Utila first as we did to walk around to the various places to see where you feel the right fit. Everyone knows when the boats are coming in on Utila and dive masters are required to wait at the ferry to bring in new business. Diving, drinking, and spinning fire at dock parties…Utila is a pretty great place! Hi! We are planning to stay at Alton’s Dive Center. Are you familiar with this place? Ant addition information you think would be helpful, please share!! Thanks! We arrived in La Ceiba during carnival and it wasn’t really safe at all. Our hostel told us to go get something to eat and come back for the night as someone had been shot earlier in the evening. You can catch the bus easily from the airport to La Ceiba, there will be a bus service at the airport. Don’t be offput but you need to go through security and they take your photo before you get on the bus. As for Utila you can pretty much walk everywhere, it’s a very small island. I think there are also bike rentals as well. I’m not I’m not familiar with Altons, just make sure you ask all the right questions in advance as some of the dive shops are really bad. Thank you so much for the response! What is carnival, and when where you guys there? We are going in Janurary. Trying to find out if carnival is during this time. Did you feel safe while you were staying in Utila? Hi! We are planning a trip to Utila soon to become scuba certified. We are planning on staying at Alton’s Dive Center. How difficult was it to get from San Pedro Sula airport to La Ceiba? We will be staying there our first night and catching the ferry the next day. Did you feel safe at all times will in La Ceiba and Utila? Any other information you think we would need to know, please share!! Thanks! Diving was the most awesome experience. I NEVER thought that I wouldd be bold enough to dive What I thought was really wild. The way you lose sense of up and down, and in low visibility, you can turn around and suddenly be two inches away from something and never notice you drifted! But I thought the best part was the feeling of flying — what I would give to dive again soon! Does anyone know how to get from Roatan to Utila. My flight takes me to Roatan but I want to dive on Utila. Would it be wiser to fly into San Pedro bus to LA Ceiba and then ferry to Utila? Wow!!! Great post..Actually me and my whole family planning to go for scuba diving..I love adventurous trips and my kids too..:) and I think the things you covered through the post are quiet impressive, good job and great efforts. I found it very interesting and enjoyed reading all of it…keep it up, lovely job..
I’ve been wanting to get SCUBA certified for a long time and now after this great post, I’m thinking it’s going to be in Utila. Thanks for the wonderful blog here. Really enjoyed It! !